As the guests left on the last morning (most likely a little hungover from all the chianti at the closing night Jim Cuddy and Barney Bentall concert! ), they were all beaming. This unique vacation had re-connected many of them to the childlike joy and freedom of cycling and because cycling in this area is physically hard, many also found a confidence in themselves too-long forgotten. It was so amazing to watch their transformation. Before the trip began guests identified one of three cycling groups (espresso, macchiato, or cappuccino) to ride with. Many people start off worrying whether they will fit into the group that they selected or not. Being able to go far in Canada doesn’t always mean you can keep up with the pace or manage the Tuscan hills. And when it’s been 20-30 years since your last ride on a bike, sometimes that does but sometimes doesn’t mean you will be a weak rider. The Espressos are confident and strong cyclists. The Macchiatos are capable cyclists but 40km-60km on these Tuscan hills is plenty. It’s been a long time since many of the Cappuccinos have been on a road bike, and the gearing systems have come a long way since they were called “10 speeds”. This trip for many was an incredible opportunity; it was a RESET button. More than a few people had stories where life (or more simply just winter) had gotten in the way of being as fit or active as they wanted to be. Regardless, everyone on this trip accomplished something big. 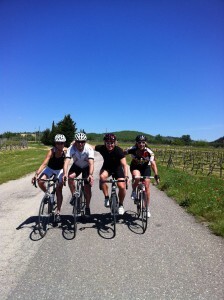 The Espressos had a century ride(100km) which, with the topography of the Chianti region, is pretty tough thing to do. Within one of their long rides the Macchiatos conquered a grueling 9km climb up to an old monastery. One guest in the Cappuccinos said to me that she had “a Yee Haw” moment when, after struggling all week to make it to the top of one particular hill, she made it with out stopping. From how many vacations do people return home more confident than when they left? It’s not hard to believe that many weren’t rested from this trip – but every single person looked incredibly rejuvenated to me. People didn’t’ get significantly more fit within the single week of riding; their improvement and success was in part due to improved technique but mostly a result of improved confidence. With some encouragement from the cycling team people tried to do something new, or more, than they had done for a long time. It was pretty cool to be part of that. This entry was posted in Marnie's Adventures and tagged Confidence, Cycling, Gold Medal Plates, Joy, Tuscany by Marnie. Bookmark the permalink. Thanks, Marnie, for all you did to make the trip an outstanding experience for the second year in row! See you in London, if not before! Hi. Where do we get travel information and cost etc for this trip? Sounds amazing!! !